If you have a TV – HD or even an old SD/CRT – that you’d like to expand the capabilities of, you can turn it into a “smarter” TV with the SmartPod from Woxi Media. It runs Android 2.3.6, which they say is enhanced with multi-user capability and TV optimized.” (You can define up to eight users per SmartPod.) It has built-in 802.11 b/g/n WiFi, an ARM Cortex A9 CPU, ARM Mali 400 GPU with 2D/3D Hardware acceleration, 512MB RAM, 4GB internal flash memory, and an external slot for up to a 32GB card. It has composite video and RCA stereo audio connectors for SDTVs and an HDMI 1.3 connector for HDTV. 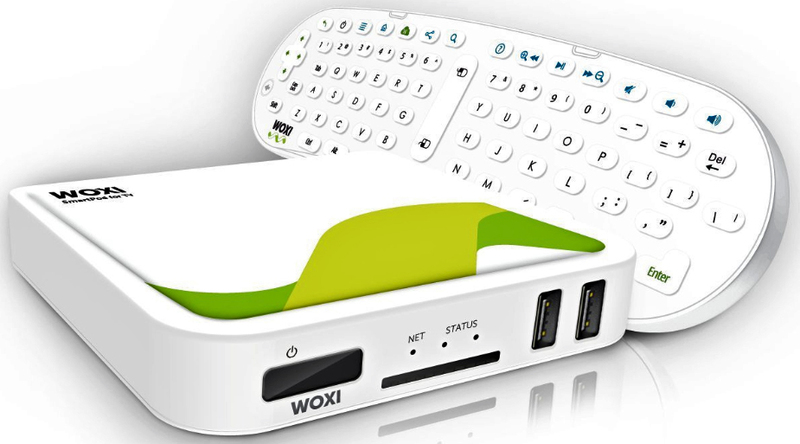 The “air mouse” remote acts as a gaming controller and has a full QWERTY keyboard. You’ll be able to stream media, access social media sites, and play games on the SmartPod and you’ll have access to the Google Play store to add apps. Go to the Woxi Media website to learn much more about how the SmartPod can add smart TV functions to your existing TV and to see a list of international dealers. The SmartPod is available in the US from Amazon for $129.00. It runs WHAT version of Android again? I can’t be reading that right… this is 2013, isn’t it? You know so far, of the different TV gadgets that I’ve tried (popcornhour, Boxee box, Roku and Plair, the best and easiest to use has been the Roku. I love my Roku, too, especially now that I can watch Time Warner cable channels on my TV without a cable hookup. I just wish TW could show the local network channels, too. The WD live will play back files noting else can touch, but the GUI makes it unusable. As far as I can tell, Boxee Box is dead, and it just wasn’t that great to start with. @David I still have a Mac mini in a drawer somewhere. I’m wondering if it might even beat the Roku. Maybe… It should be able to play the MKVs. There are many little thumb type devices for TV’s on Amazon for about £30-£40 (that would be $40-$60) that rock Android 4.x.x. Sadly will only work via HDMI and you’d have to buy a keyboard etc. Got one recently and love it, I had a blue tooth keybord and spare wireless mouse and also was able to download an Android app for free that also allows me to type, use touch and the internal sensors all worked perfectly with no problems, oh and has full access to Google Play. The particular one i got had 1 gb of ram and 8 gb of storage with the opition for micro SD card as well. Makes this on look a little expensive maybe. But if you have an older TV without HDMI I could see its appeal. @Julie You know me, I have PC’s that can play them, but I want a nice tiny low powered (<10 watts) that can play anything. Heck, my Zbox nano AD12 can handle them easy, but that's way up in the 20 watt range! (less than the Mac mini, but it's slower). Where is the review? This reads like an advertisement straight from the manufacturer’s website. @Gene This is a news item, not a review. If it had been a review, it would have had “review” in the title. I love my Roku. It was the best purchase I ever made. The best Android TV Box by far is the SkystreamX. It has a dual core 1.5 Ghz processor, Mali 3d graphics processor, 1 Gb Ram, 8Gb internal memory, Preloaded with all of the good XBMC add ons and Android 4.2.2.